If you were in a bathtub for 25 years, don’t you think you’d get a little bit psychotic? Well, yes, probably. But this is how captive killer whales live. Tilikum is no different from many of these. A 31-year-old orca who was scooped out of the North Atlantic in 1983, aged two, he has spent the remainder of his life in captivity. Over that time, he has grown to weigh five tons, and has been ‘involved’ in the deaths of three humans. He currently lives at SeaWorld in Orlando, and the documentary Blackfish tells his tale. Much of the video footage in the film speaks for itself; but the interviews that accompany it are equally gripping. From the whale-hunter who is haunted by the sound of mother whales calling for the calves that have been taken from them, to accounts of captive whale behaviour from former trainers. Caging lions and tigers is one thing. We rarely expect these animals to engage with humans. Orcas, on the other hand, frequently do. Until 2010, orcas at SeaWorld were expected to perform with their trainers to amuse the paying public. These are highly social creatures, with brains almost as developed as human ones, and close family ties. In the wild, they travel up to 100 miles per day. At SeaWorld, a cement pool does the job. 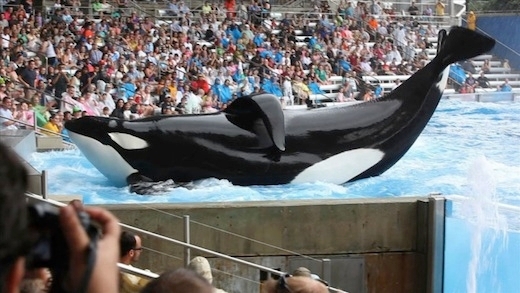 Is it any wonder Tilikum behaves the way that he does? It’s almost impossible not to feel for these highly intelligent creatures who, many argue, are kept solely to fill SeaWorld’s coffers. Blackfish is out now on Blu-Ray and DVD, and is also available on iTunes.